Even with an economy that’s stubbornly stuck in neutral, data storage professionals’ paychecks reflect modest yet welcome increases. Data storage professionals are holding their own during precarious economic times, according to the ninth annual Storage magazine/ SearchStorage.com Salary Survey. They’re managing to increase their overall average salaries and stay optimistic that their paychecks will continue to grow in 2012. Despite ongoing unemployment issues and fears of a double-dip recession, storage pros who responded to our in-depth survey regarding their salaries, careers, incentives, budgets and benefits managed to increase their year-over-year earnings for the ninth year running. When it came to storage projects, our 266 survey respondents seem to fall almost evenly on either side of the recession vs. recovery argument: approximately half reported they were in “maintenance mode” with budgets restricted. The other half detailed ambitious projects such as multisite data center migrations, creating virtual environments and moving to private clouds. Asked to become experts in more technologies each year, this year’s crop of respondents expressed a shared concern there isn’t enough time in the day to learn everything there is to know about today’s data storage market. 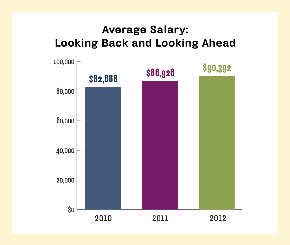 Our 2011 Salary Survey respondents earned an average of $86,926, a 5% jump from their 2010 salaries. When looking ahead to 2012, this year’s respondents predicted their average annual salaries would jump by another 4% to $90,392. This year’s respondents saw a larger year-over-year increase than last year’s crop, who barely managed a 1% increase in pay vs. 2009. Participants were also a bit gloomier last year, predicting their salaries wouldn’t budge in the coming year and might even drop. The current group’s estimated 4% jump would translate to nearly a 10% raise between 2010 and 2012. Enlarge AVERAGE SALARY: LOOKING BACK AND LOOKING AHEAD diagram. Our 2011 respondents reported salaries that were 5% higher than last year. This year’s crop of respondents saw a greater year-over-year salary increase than last year’s respondents. They also beat out the 2009 class of survey participants when it came to annual increase in pay. Respondents expressed a high level of satisfaction with their employee benefits in the four categories we surveyed: health, dental, vacation and flex-time. A little more than 60% rated their health benefits as good, very good or excellent. 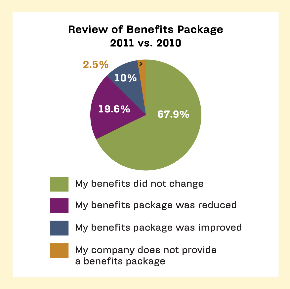 The majority of respondents (67.9%) said their benefits packages didn’t change compared to last year; 10% cited improved benefits while 19.6% saw them reduced -- not a very encouraging number but a definite improvement vs. the 30% who fell into that category last year. Enlarge REVIEW OF BENEFITS PACKAGE: 2011 vs. 2010 diagram. Overall satisfaction with company benefits plans was high. 19.6% saw benefits reduced and some reported being asked for higher co-pays. How many terabytes are in your paycheck? In 2011, storage pros managing the largest data stores -- more than 500 TB -- commanded the highest annual average salary at $110,085. Otherwise, the results weren’t conclusive enough to say that paychecks grew right alongside the amount of data managed. There was also a steady rise in compensation as it related to the number of direct reports. Storage pros managing small teams with fewer than five people earned $81,608, and the average salary climbed steadily to $122,667 for those managing between 21 and 50 IT team members. Enlarge AVERAGE 2011 SALARY BASED ON TERABYTES MANAGED diagram. Storage pros managing the largest teams and the most terabytes earned the highest salaries. Just as with terabytes, bigger budgets add up to higher pay. Managers with budgets less than $500,000 earned average annual salaries of $77,140. Those managing budgets between $1.1 million and $5 million earned $100,740. Respondents from the Pacific region (Alaska, California, Hawaii, Oregon and Washington) averaged salaries of $95,526, pushing them to first place after the region ranked fourth in last year’s survey. New England, and the Northwest and Southwest regions were bunched closely, finishing second, third and fourth, respectively. The Southeast region brought up the rear (as it did last year) with an average annual salary of $79,161. Slightly higher was the Mountain region (repeating last year’s placement) with an average salary of $79,837. In Canada, data storage professionals reported earning an average annual salary of $85,938, putting them ahead of two U.S. regions. 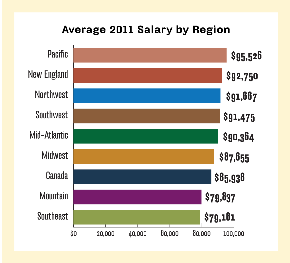 Enlarge AVERAGE 2011 SALARY BY REGION diagram. The Pacific region took top honors in the regional salary comparison. Last year’s winner, New England, ranked second. Nearly all our regional divisions ranked closely together in terms of salary; only the Mountain and Southeast regions averaged below $80,000. College graduates earned more than high school graduates, but only by a sliver. However, years of dedicated data storage experience definitely make a difference -- no matter what the level of education. A college graduate with less than two years of dedicated storage experience averaged $78,064. With six years to 10 years of dedicated storage experience, salaries rose to $88,303. A warning to newbies: In tough economic times, many companies weed out applicants without diplomas. Another way to increase salaries was to have one, two or three certifications, with each one boosting earning potential, according to our survey. After three, however, the math stopped working and paychecks leveled off. 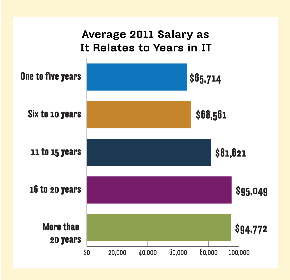 Enlarge AVERAGE 2011 SALARY AS IT RELATES TO YEARS IN IT diagram. Years on the job count, but the real payoff is in years of dedicated storage experience. College graduates earn about the same as IT pros who attended college for two years. The highest paid group of survey respondents held Master’s degrees and had more than 10 years of dedicated storage experience. A little more than 65% of respondents cited salary as the No. 1 factor in their choice of job. Career advancement was the second reason cited by respondents for changing or taking a new job. When asked about the least important factors in their job choice, benefits (43.3%) and location (25.4%) landed at the bottom of the priority list. Only 1.3% of respondents voted salary as their least important factor. Enlarge MOST IMPORTANT/LEAST IMPORTANT FACTORS IN JOB CHOICE diagram. When choosing a job, salary trumps all other considerations. Career advancement ranks second in considerations, while location and benefits competed for least important factors. In 2011, survey participants were squarely focused on that most valuable of resources: time. Whether it was the speed at which projects get completed, the hours spent on documentation or red tape -- or too many hours spent in a car and too few at the dinner table -- respondents were made happy or unhappy depending on how much control they had over their time. Long hours, long commutes and projects with elusive end dates were all reasons for job dissatisfaction. Working at home, the satisfaction in meeting deadlines and seeing results, and the ability to work fast without a lot of higher ups having to sign off on every move were all named as reasons to appreciate their current positions. Smart peers and respect from the business side of the company go a long way. Business leaders who undervalue storage and budget cuts continue to plague storage pros. Work-life balance helps ease the pain. BIO: Ellen O’Brien is the Executive Editor for the SearchStorage.com and SearchCloudStorage.com websites.